I just re-discovered my “Just Fair” series with a new post yesterday and today I will do the same with my favorite feature on my site. “The History of Joakim Soria” is a series where I make a Joakim Soria card for every Topps base set over their 60 year reign. Today’s installment is 1982 Topps. Another classic design. It wouldn’t crack my top 5 Topps designs of all-time but it would be close. They are a very clean and simple looking card and look great. When I think of 1982 Topps I think of Cal Ripken. Ripken was and is my favorite player and 1982 was his rookie year. He has a multi-player rookie card in the base set and a card all to himself in the traded set. The traded card is one of the most iconic cards in history in my opinion. So this is why this set has always held a special place in my heart. 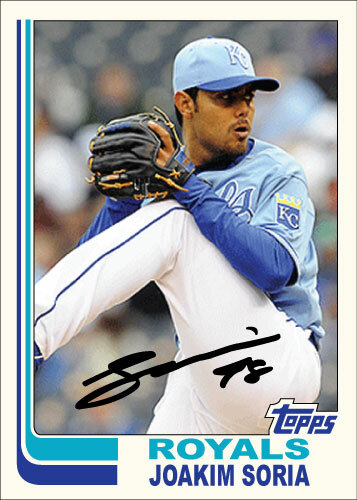 I like the powder blue shot of Soria here. His high leg kick leaves a great space to display the autograph as well. This is a card I will have to make more variations of, look for it to pop up as a “Custom Card of the Day” soon.